UPDATED: Mon., May 21, 2018, 8:51 a.m.
Surveying his latest mural from the deck of a descending scissor lift, artist Daniel Lopez felt a little doubt mixed in with his sense of accomplishment. 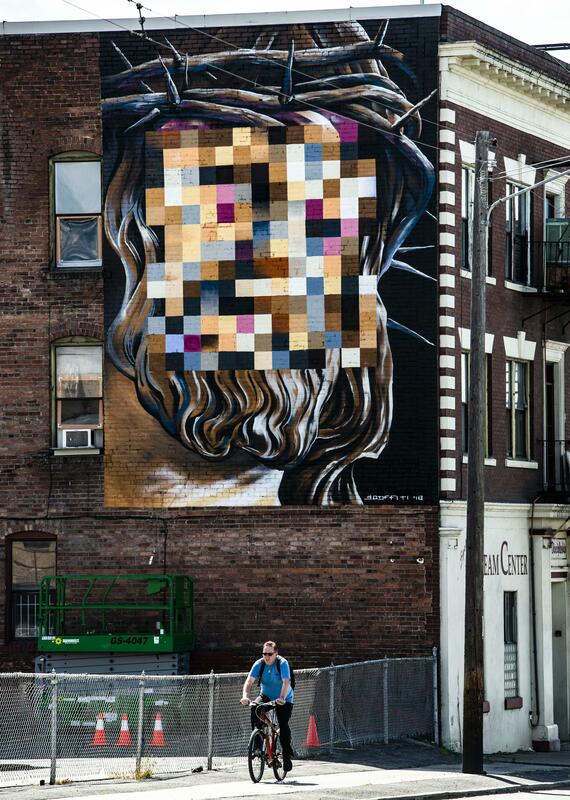 The project – a painting of Jesus, the figure’s face obscured by a mass of pixels – took Lopez four days to finish, and now covers a brick wall at 29 W. Second Ave. Drivers westbound on the avenue will see it just after crossing Division. Lopez, a full-time mural painter, said he doesn’t want to reveal the meaning behind the 14-foot-high painting that he calls “American Jesus.” But he’s happy with the support he’s found on Facebook and Reddit, even though the artist said he expects some of the public may feel the work pushes comfortable boundaries. “That’s the point of the whole thing. If it causes people to think and it causes some sort of reaction, then it’s doing what it was meant to do,” he said. Some of the conversation online tried to break down the meaning of the mural. The mural was funded by Rhonda Leeds, with the help of the Dream Center Church in Spokane, and the building upon which it was painted is also owned by the Dream Center. The organization serves as a discipleship center offering a 2-year program to allow men to get their lives straightened out, Leeds said. Leeds saw the design about three months ago while collecting donated clothes online. Its tone caught her attention, and prompted her to search out Lopez’s contact information. Lopez said he was “really iffy” about showing the work to Leeds, but when she saw it, she liked the ambiguity of the art. “Different people see different things in it,” she said. Lopez grew up in Southern California, where he honed his craft painting graffiti-styled artwork. He found himself in Yakima living with his sister after his grandmother died. Eventually, he landed in Spokane in 2013. “It was the scariest time of my life. I didn’t know anyone. I was by myself,” he said. That’s when Lopez saw a mural in Browne’s Addition and thought, “Oh, wow. Maybe I could that,” he said. So he offered to paint a mural on Ash Street, and his design was accepted. In 2016, Lopez painted a mural on the Boulevard Building in the North Side neighborhood. It depicted Spokane’s history, showing a carousel, old cars and children playing jump-rope. In 2017, he also painted the Altamont Street underpass mural of birds set to a blue background. Published: May 20, 2018, 4:41 p.m. Updated: May 21, 2018, 8:51 a.m.